The Outdoor Freestanding Digital Poster just got some big upgrades… at no extra cost! 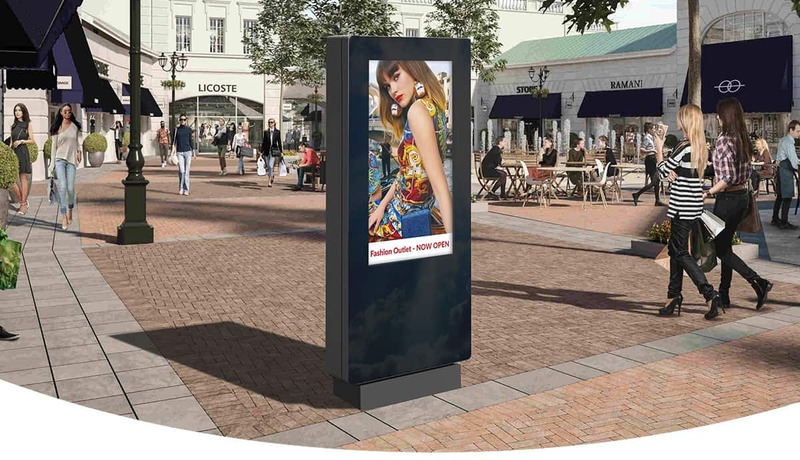 The Outdoor Freestanding Digital Poster is now better than ever thanks to the latest upgrades; making it the most stylish and flexible all-in-one outdoor Digital Signage display on the market. Available in 49” and 55” models (other sizes available on request) superior Digital Signage is unleashed and ready to rock the big wide world outdoors! 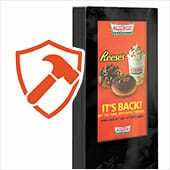 Thicker Stronger Steel – Increasing the vandal resistance while retaining a sleek and attractive design, the Outdoor Freestanding Digital Posters just got tougher. 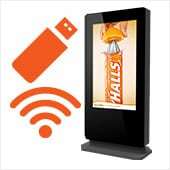 Thanks to an even thicker steel industrial grade enclosure ** these displays are now suitable for even more locations. 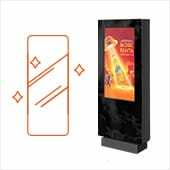 Glass Front Display – The upgraded Outdoor Freestanding Digital Posters now come with a glass front that covers the entirely front face of the screen. 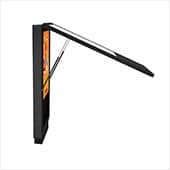 The toughened anti-glare glass is also scratch resistant giving the display stylish tablet-like aesthetics with optimal clarity. Protective Paint – The enclosure of the display is coated in a new special enamel paint that is even harder wearing than ever before. This improves the overall durability and reduces rusting. 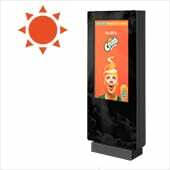 Sunlight Readable – Brightness is key when using outdoor Digital Signage, our Outdoor Freestanding Digital Posters use 2,500cd/m² Ultra High Brightness panels (with an ambient light sensor) more than 8 times brighter than a standard LCD panel to allow easy readability in direct sunlight. 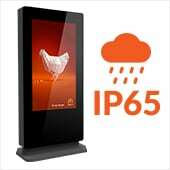 IP65 Rated Enclosure – Suitable for the harshest of outdoor conditions. The outer casing has an IP65 rating which means it keeps out all airborne swarf, dust and other particles as well as being protected from any wet weather conditions; broadening the range of possible environments. 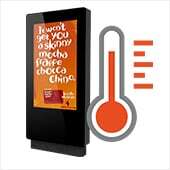 Smart Temperature Control – Able to withstand hot and cold surroundings these displays manage the internal conditions to maximise the life of your product. Built in air-conditioning can now be tailored to allow the display to work at an optimal level in any climate. Easy Maintenance – The screen is designed to allow for easy and quick access using hydraulic cylinders when maintenance is required while still being secure. Easy Updates – The screen can be updated in two ways; either by USB plug and play or with our online CMS network solution. 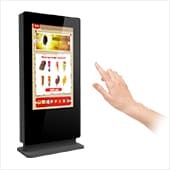 Touch upgrade – Optional extras include a PCAP touch screen upgrade with 10 touch points. Other hardware integration or modification is available on request. The brand new 49” and 55” Outdoor Freestanding Digital Poster are in stock now and available for immediate dispatch. For the latest prices and special offers please click “here” or give us a call on 0121 421 4458.